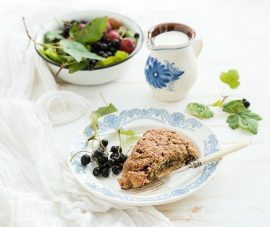 For those out there who love scones but dread having to pay for them at the local café, you can always make your own at home, such as these Manuka honey glazed berry scones. If you think you’d like to try making these scones for yourself, then let’s get started on the recipe below! Scones: Adjust the rack of your oven to its middle-upper position before preheating to 425 degrees Fahrenheit. Line a cookie sheet with some parchment paper. Note: If the berry mix you’ve chosen has strawberries, slice them in half before tossing all the berries with confectioner’s sugar in a large bowl. Freeze the berries until needed. Combine the flour, six tablespoons of the butter, the granulated sugar, the salt, and the baking powder in a food processor, processing until the butter has incorporated fully, which should take around 15-20 seconds. Add the other six tablespoons of butter, pulsing until the butter is in smaller pieces, which should take between 10-12 pulses. Move the mixture to a large bowl, and then stir in the berries. Beat the milk, the egg, and the yolk together. Make a well in the center of the flour mixture before pouring in the milk mixture. With a spatula, stir the mixture gently, scraping from the edges of the bowl and mixing inward until a dough forms with a little flour remaining. Try to avoid overmixing. Turn the dough out onto some floured counter space and briefly knead until the dough comes together. With a bench scraper and your hands, shape the dough into a 4-inch x 12-inch x 1.5-inch tall rectangle. Cut the dough crosswise into four equal rectangles before cutting the rectangles into two triangles, leaving you with eight scones. Move the scones to your prepared cookie sheet, baking until the scones have a lightly-golden color on top, which should take between 16 and 18 minutes. While the scones are baking, combine the Manuka honey and the melted butter together in a small bowl to make the glaze. Remove the scones from the oven, evenly brushing the tops with the glaze. Afterward, return the scones to the oven, continuing to bake till the tops are golden brown, which should take 5-8 minutes. Move the scones to a wire rack, allowing them to cool for roughly 10 minutes prior to serving. Note: If you plan on making your scones ahead of time, you can freeze unbaked scones for several weeks. Once you’ve cut them into triangles, you may freeze the scones on a cookie sheet before moving the scones to a zip-lock freezer bag. Once you’re ready to start baking, heat your oven to 375 degrees Fahrenheit, extending your cooking time to 23-26 minutes. The glazing time will be 5-8 minutes as before. Nutrition Info: 446 cal, 200 from fat; 23g fat; 106mg cholesterol; 571mg sodium; 54g carbs; 2g fiber; 17g sugar; and 7g protein. Need to order some Manuka honey to make this recipe? To get your order started, click here. And, remember, we offer FREE shipping on all orders of $150 or more!